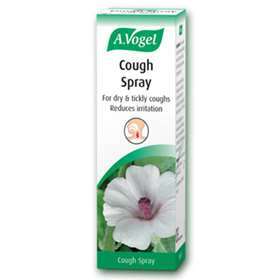 A.Vogel Cough Spray helps to reduce irritation whilst relieving dry and tickly coughs. Suitable for adults and children over 4 years old this A.Vogel Cough Spray contains mullein and marshmallow. By creating a protective film layer in the throat and offering a soothing effect this cough spray reduces irritation. Can be used together with other medicines including cough remedies. If you suffer from a chesty cough, the A.Vogel Bronchoforce will be more suitable for you. Do not use if you are allergic to honey or any of the other ingredients. Children should use the product only under adult supervision. Contains honey which has natural sugars. Each dose of 3 sprays contains 0.3g carbohydrates (0.3g sugars). Patients with diabetes should take this into account. As a precaution, use during pregnancy or when breast-feeding is not advised.